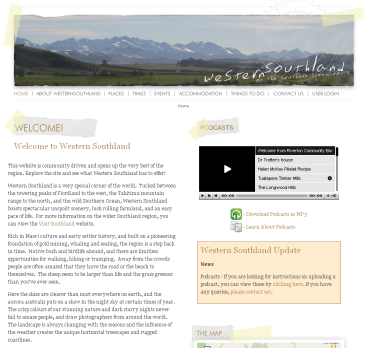 The creation of www.westernsouthland.co.nz brings the whole community together to develop the content of their web pages using open source software created by AUT University's New Zealand Tourism Research Institute (NZTRI).Director of NZTRI, Professor Simon Milne, says the website is like no other. "It's a tourism marketing and development tool as well as a community building instrument for the people and businesses of the area." The community-built website allows people and businesses to determine how they would like to be portrayed to visitors and the rest of the world. Tips from locals on the 'good places to go', events, accommodation, trails, and things to do are all treasured nuggets for visitors. The website serves as a digital resource for community heritage, and can also be used to inform visitors of what to expect, and how to behave, when they get to a community.